To celebrate the start of MO-BOT High Season 2, those nice chaps over at the DFC website have updated the MO-BOT High page with some funky new stuff, including the full - for now- set of trading cards / character profile thingys what I made. 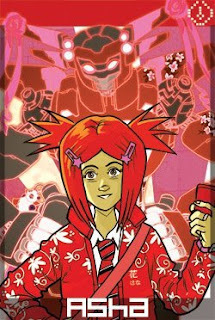 I've just put the first episode of my DFC strip MO-BOT High up on my website where you can read it for FREE! How about that. If you like what you see, hey, why not subscribe to the DFC? And don't forget, Season 2 begins in issue 22 - on sale tomorrow! At the moment I'm doing all my pencilling and inking digitally, using a program called Manga Studio (mostly for reasons of efficiency, although also 'cause its just really quite fun). One of the cool things about the application is that it treats a project as one story, not just a whole bunch of unrelated image files. 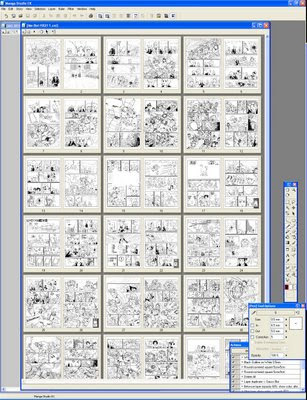 So you get to look at your whole story spread out before you, and get a great sense of progress as the blank pages get filled in as you go along. It's all very small, anyway. Hopefully no-one's enjoyment of the story has been spoiled this way! Did I mention that Season 2 starts next week? Its going to be pretty skill. Only Ken and Ryu, I find it hard to be Blanka"